The photo at right shows three of my students from Michigan. You can see they were painting from the same reference photo, but each piece reflects their style, personality and palette choices! It is so much fun to see the individuality come out in my student's work! 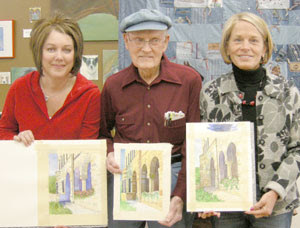 http://watercolorworksart.com/Classes.htm - Below the schedule of classes you can click on the link for online registration. Currently, in my personal work I am working on a painting of a Bird of Paradise flower. I have been taking progress photos of the piece. Keep watching to see some of the progress in the next few posts.